The API 235L Noise Gate/Expander has the ability to reduce noise in any type of program. The 235L can open unusually fast, without losing any part of the sound. Its extreme flexibility, repeatable settings, and superb sound make it ideal for all studio, live sound, and broadcast applications. The 235L is one of the fastest noise gates manufactured today. 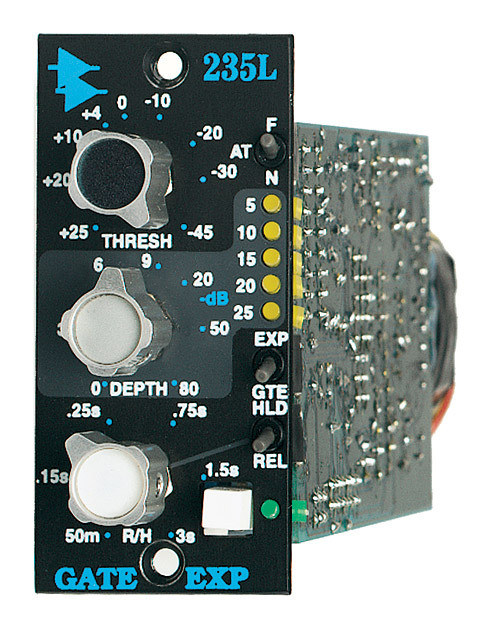 When an engineer is faced with program material with a high level of background noise, the 235L can either Gate the signal at a preset Threshold, or with the use of the Expander function, can reduce the background noise to an almost undetectable level. This can be achieved without the typical loss of the program material caused by slow triggering of the signal, or "pinging" caused by false triggering. With a wide range of adjustment, the 235L can operate from -45 to +25 dBu, fitting into any audio situation regardless of program level. Once the Threshold level is set, the Attack time can be selected to react faster than 100uS or slightly slower than 25mS to reduce false triggering. Although the Depth control has a full range of -80 dB, the scale is expanded in the first half of rotation so 0 to 9 dB is available for fine tuning of subtle, undetectable gating. The second half of rotation is from 10 to 80 dB for more drastic noise reduction. The Expander function uses a 1:2 ratio, allowing the signal to "sneak up" to the full signal level without any loss of "under threshold" vocal or percussion nuances. Setting the threshold in the Gate function to the desired level, then switching to the Expander mode is the perfect setup. For special gating functions such as the famed "gated snare reverb", the Release function can be switched to Hold, and the Release control becomes the Hold time. In both scenarios, the unselected function has a set time of 100mS. When used with the other 200L series modules, a complete input strip can be built from input through dynamics, equalization, and final output. The 235L makes use of the 2510 and 2520 op-amps and therefore exhibits the reliability, long life, and uniformity which are characteristic of all API products.